ase see selection of mezuzah cases below. For tips on buying mezuzot, click here. Square mezuzah case with chain and Jerusalem design. Click to enlarge. 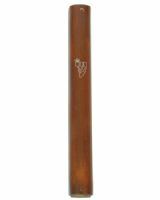 Mezuzah case in dark brown; round cut, opaque, lower screw. Click to enlarge. Etched narrow glass mezuzah, indented border. Gold "shin". Click to enlarge. 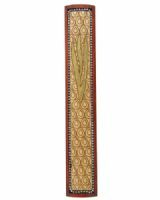 Octagonal wooden mezuzah case with metal chain border, opaque. Click to enlarge. Light wood with dark teardrop design with surrounding chain. Click to enlarge. 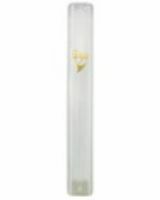 Clear plastic mezuzah case, round cut, can also be glued to doorpost. Octagonal shaped wood mezuzah case with dark wood edges. Lower screw. Click to enlarge. Wooden mezuzah case light &dark with slit and metal "shin" on top. Click to enlarge. 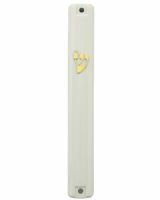 Plastic mezuzah case in white with goldor silver colored writing. Click to enlarge. White ,can also be glued to post, round cut,Assortment of sizes. Click to enlarge. * Please check the itmes you are intrested in.